Ours is the level three grade NICU. 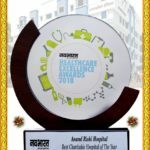 The NICU of the hospital is sophisticated and fully equipped for care of high-risk babies, which are referred from in and around villages of Ahmednagar district. 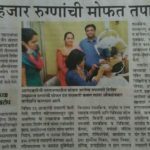 Department is run under experienced Neonatologist. We are having Incubators and warmers. We are having capacity to admit 10 new born babies in our NICU Unit. 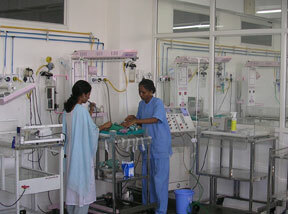 NICU has got central O2 system & nitrous oxide for emergency & having central suction facility. The patient can be viewed from all the sides for better nursing care. It also has the ABG analysis system and multi-channel monitors. 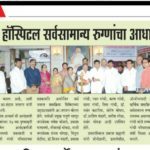 With these additional equipments NICU has become unique in Ahmednagar district as no other hospital is providing such facilities. In case of emergency paediatric ventilators are present to save the life of patients, by giving advance paediatric life support. The neonatal qualified paediatric surgeon performs surgeries and the congenital malformations like diaphragmatic hernia perform the neonatal surgeries, tracheoesophagal fistula etc can be handled. The nursing staff is qualified to deal with emergency and super consultant & consultants are looking after round the clock. Regular cultures swab are done to prevent infection in the nursery and in NICU. We have also expanded set up of 18 beded Paediatric Intensive care unit. Social Impact: This is the only tertiary care centre with well Qualified Doctors catering treatment to high risk neonatal patients. 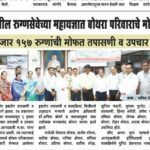 We do receive all types of emergencies and high risk cases from all over Ahmednagar district. 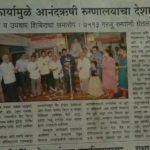 It is the only centre in Ahmednagar running post graduate Medical courses in Paediatrics (DNB). Due to poor economical condition families are not interested in offering their girl child a good treatment. So at our centre we are straight way offering concession ranging from 25% to 100% depending on economical condition of their parents to baby girl child.